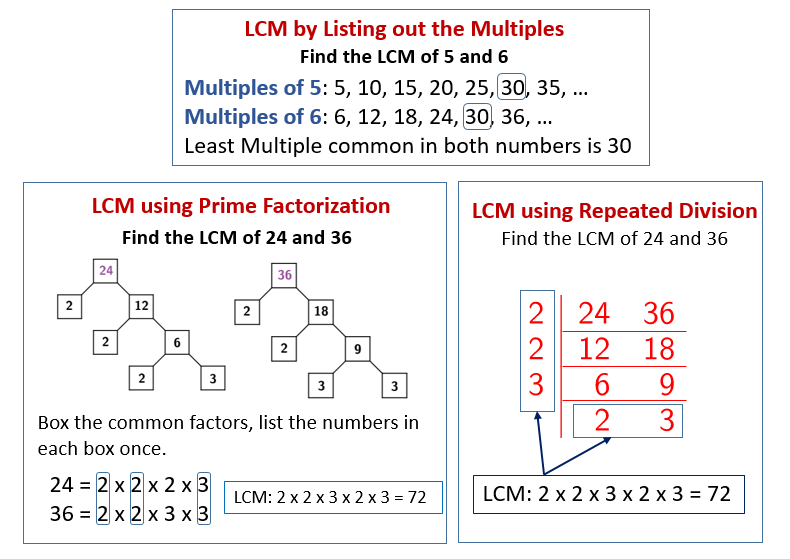 The following diagrams show how to find the Least Common Multiple (LCM): by Listing out the Multiple, by using Prime Factorization, by using Repeated Division. Scroll down the page for examples and solutions. The smallest number among the common multiples of two or more numbers is called their least common multiple (LCM). Find the LCM of 2, 3 and 6. The smallest among them is 6. Therefore, the Least Common Multiple (LCM) is 6. Using the lists to find the LCM can be slow and tedious. A faster way is to use repetitive division to find the least common multiple. Divide the numbers by prime numbers. If a number cannot be divided it is copied down to the next step of division. Find the LCM by listing the multiples of each number and find the smallest one that is common. Another method is to use prime factorization. What is the least common multiple (lcm) of 15, 6, and 10? How to obtain the least common multiple using the repetitive division method?